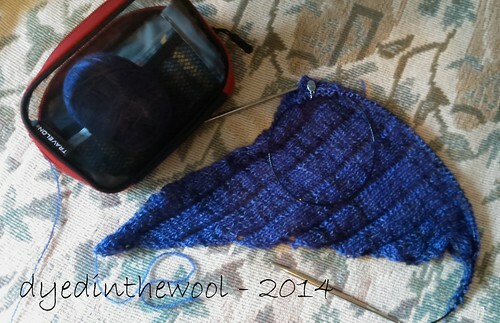 But I’ve rather stalled on the colourwork sock. 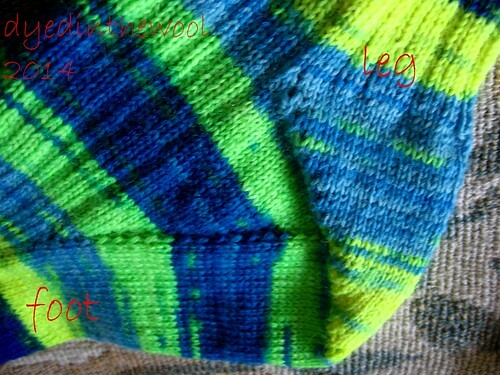 Again, showing the inside of the sock, because this is how I knit colourwork (colorwork!) in the round. I’m now having doubts about the design and my ability to make a good quality pattern for my own semi-self-imposed deadline. But it would be for a great cause. I’m unsure, is the long and short of it! Still working on my new sock design. 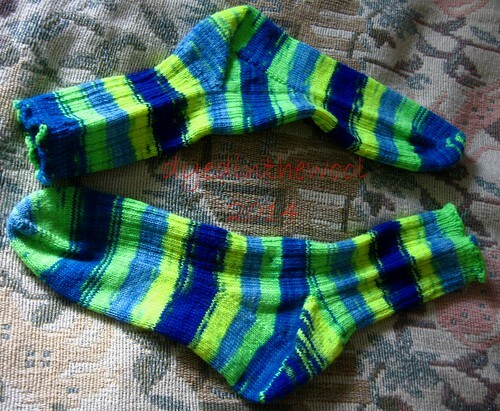 I knit stranded stuff “inside out” when working in the round, so this is wrong side. A Terraform scarf (by Cheri McEwan) in some Mean Girls Yarn Club sock yarn that’s been marinating in my stash for a while. I needed some mostly-mindless TV knitting and this fit the bill. And, finally, a very old UFO. BEHOLD THE RETURN OF SWARTBOS!!! It’s Rooibos from the Winter 2009 edition of Knitty. According to my Rav project page, I started this in May 2011. Twenty eleven!!! 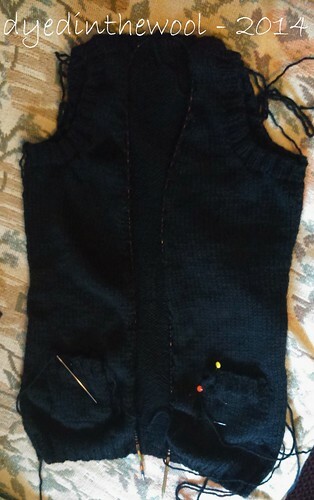 All I had to do was the ribbing on one armhole, the front bands and sew the pockets closed. sigh. At least I’m actually working on it now! The yarn is all my dad’s fault. And the fault of some of my Facebook friends for posting about this fabulous NEON!!!! yarn from Regia. The pattern is very straightforward and wonderfully uncomplicated. 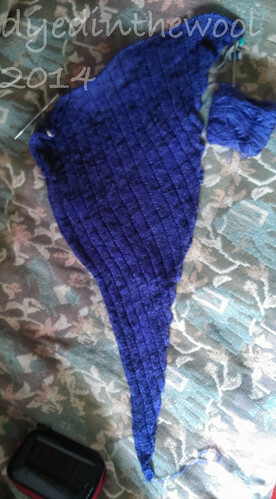 The fit appears good (but no modelled shots, sorry) and the irregular rib pattern made for a semi-mindless project. All-in-all, I’m very pleased with the whole thing! 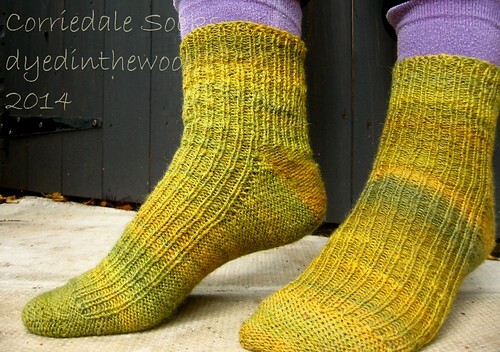 Pattern and project: Time Traveler Socks by Liz Sedmak. 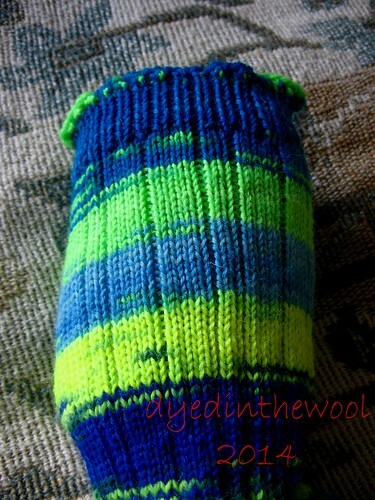 My Ravelry Project Link. No major modifications at all! I’m really pleased with how these turned out. 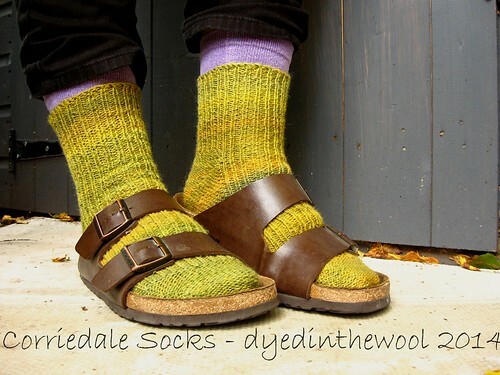 Oh yeah, I rock the Birks and socks look. Rock. It. Handspun Corriedale wool [part of the Wooly Wonka Fiber 2011 Wine Club] (approx. sport weight). Spun on Bliss TT wheel. Singles: s-twist. Plying: Z-twist Navajo-plied. Worsted short-draw. High twist. Approx. 200 m(?) used. I spun the fibre as I found it; no pre-drafting or splitting to manage the colour. Two 2.75 mm circular needles, 60 cm long for “two circulars” technique. 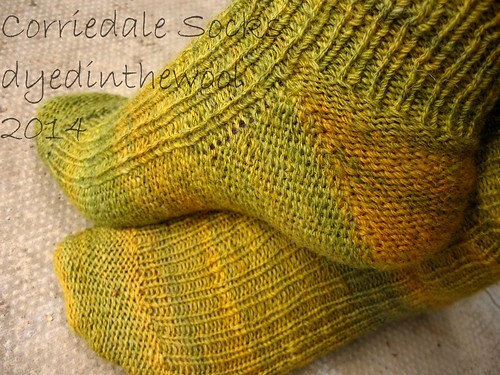 This is my favourite sock pattern for sport-weight yarns. I love the way the heel fits and I can (almost) make it with my eyes closed! I went with a very simple K1/P1 rib to give maximum comfort in-boot. You may notice that I’ve shown these with purl-side-out. This is because it’s how I wear the majority of my socks. I have precious snowflake angel soles. The cuff is pretty short, but I don’t like a tall sock for walking/working boots. 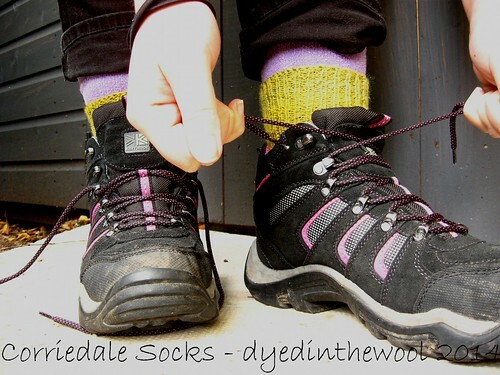 I made the sock using the inside strand from a centre pull ball but did the heel turn/flap (it’s not really a flap) with the outside strand of yarn. This is partly to preserve the colour sequence but also future-proofing against needing to replace/repair the back heel. 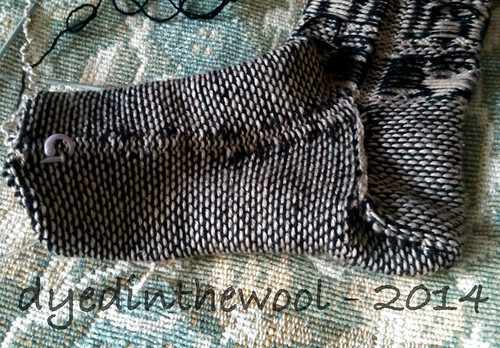 The Corriedale is not next-to-the-skin soft, but I’m hoping it will do okay for a hard-wearing outer sock. In “action” as, ya know, boot socks. 1/1 rib, beg w/ p1. Inc to 44 sts on sole ndl (70 rnds in foot). 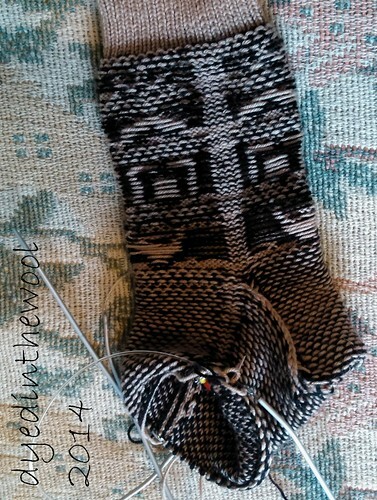 Finish heel w/ outside strand. K one half rnd. Break yarn. K same half rnd again with inside strand. Work 4 rnds, k back leg sts & 1/1 rib front sts. On 5th rnd, inc 1 st centre back sts. 40 rnds in leg (all 1/1 rib). 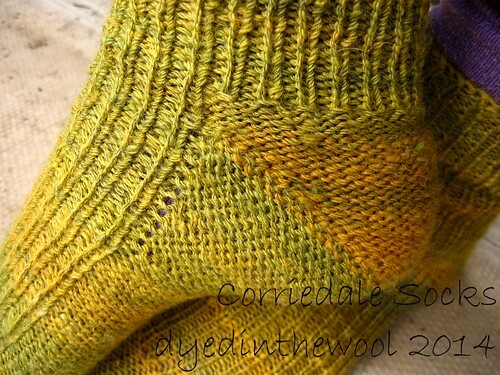 Another languorous look at the heel.